Gandermonium: Yakety Yak, Rossi's Back! There is only one thing I can really write for this blog. Ross Stearn, that is all! Wise men say……..no come on, I am a professional. It’s all part of being a Civil Servant! So on Thursday we saw the final qualifier for the World Cup and it’s a welcome back to Peru, completing the 32 countries. I do not rate England’s chances at all, and this has to be the most boring, unimaginative England side I have seen. I would also like to personally advertise that if you are doing the Panini sticker book for this summer's tournament then I am happy to do swapsies. I'll now turn my attention to the circus that is Billericay Town and their hypocritical tool of a manager/owner. I have to admit I did not watch the game as I had a feeling it would be an outpouring of bias towards Billericay from BT (It was - Ed). However, I owe a thanks to Natalie for letting me know the result and well done to Leatherhead for ending the circus! PS. If anyone hears from Mr Tamplin please let me know as I am so worried about him, as I write he's not re-appeared on social media since. Now its time to finally move on back to Sutton and Friday afternoon sees our Dos tweet that there is to be another returnee to the club, just a week after Bolarinwa’s homecoming the previous week. It is no secret to our readers as to whom I would like this second returnee to be….although I think Harry Beautyman would have also been a great choice. I have never ever refreshed Twitter so much in the space of half hour leading up to 8pm. 8:01 and still no news……what’s going on? 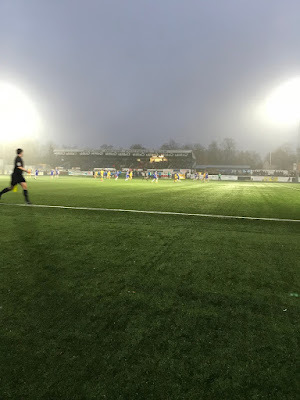 And then another refresh and there is the update I was absolutely thrilled to read – the return of Mr Ross Stearn (aka Rossi) to Gander Green Lane. I had to keep my celebrations as quiet as possible though as my sister had just put my niece to bed. 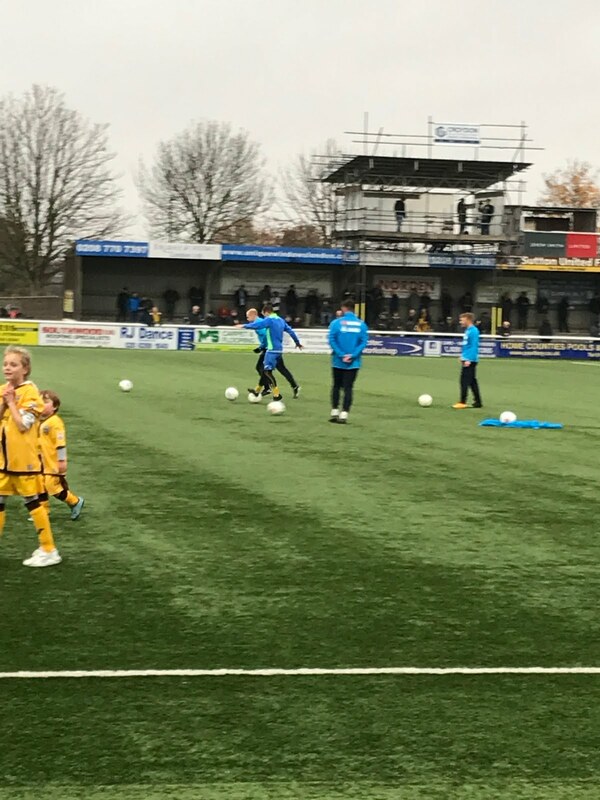 Game day arrives and I have to say this is the most excited I have ever felt about a Sutton game in a good while; however I find that Rossi cannot start today as the paperwork was not completed in time. Although saying that due to his lack of play for a club I cannot name out of spite he probably needs to get some match fitness before playing from the start again. I take a place along the side to catch the team warming up and I spot Rossi having a kick about; so he definitely is here today. 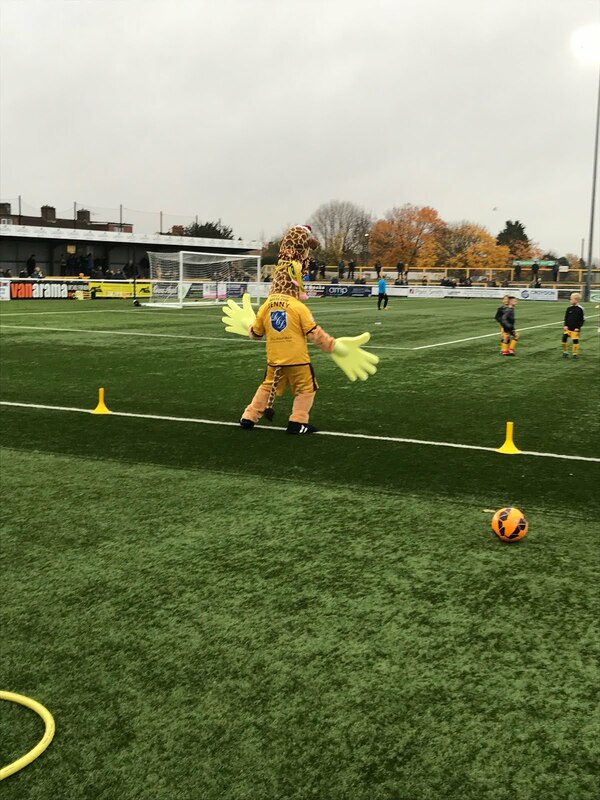 Also having a warm up is our very own Jenny the Giraffe, who later this evening will be turning on the 2017 Christmas lights in Sutton High Street. To be fair she does save quite a few penalties although the gloves are a bit too big. As kick off happens it’s weird again to not be taking a spot behind the goal at the Collingwood Rec end thanks to today's segregation; however it takes a three attempts to get kick off going – what a fussy referee and there is more to come from this said individual as the game progresses on. What also progresses on is the terrible weather, that light fine rain which will no doubt make the job for the goalkeepers worse. Again more to come later. 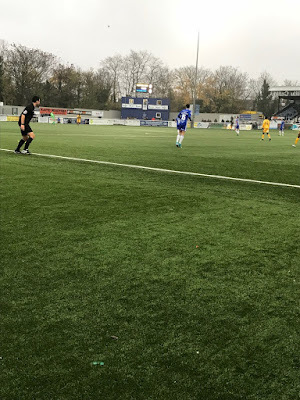 Now remember the referee, he is called into action in as little as the third minute as it appears Lafayette has been clubbed by the Halifax number 5 – what a whazzock this bloke turned out to be – again more later. No cards brandished even after a lengthy discussion – says it all about Halifax’s tactics but it’s our poor Dos who gets on the receiving end of a talking to by the referee – referees again eh controlling the game! Talk about a team only setting out to cause harm and injury, reminds me of Stoke City! This only leads to Sutton playing the better football and the first real chance of Josh Taylor who has a low shot hitting the post and going out of play. The woodwork again comes into play as Kieron Cadogan runs forward smashing a 25 year shot onto the bar. This makes me subsequently think hopefully this is not the case throughout the game. his then brings a chance for Halifax and Jamie Butler making a couple of great saves and the most outstanding being a double save in the space of a few seconds either side of a corner. You know what’s going to come next. As half time approaches I join Half-Time Steve in the bar and at what we think is half time, we hear a big cheer from outside and yes readers, you guess correctly, I've missed another goal. This must have been in the third minute of stoppage time – goalscorer Ross Lafayette. So that’s four I've now missed this season, looks like the prediction of nine from this summer will be met! After the sinking of my beer it is time to head out for the second half. In the 58th minute good work from Kenny Davis on the left hand side crossed into the box and after a blocked chance by Becks and the bar struck by Lafayette falls back for Dundo to slot in the second. Although any thoughts of the game being seen out are ruined only six minutes later as Halifax pull a goal back. It’s fair to say this caused a bit of anxiety amongst us fans but I decide to make a bit of light hearted relief – one of their players has the surname McManus. Anyone who knows me, knows I am bit a of reality TV fan – it’s all for quizzing purposes decide to shout out “How’s Michelle” Michelle McManus being the second winner of Pop Idol back in 2003. This brings a bit of a laugh from Mark Notton and his friends from up north. Anxious feelings were then (we thought) put to rest when a Kenny Davis free kick is met by the head of Ross Lafayette to make it 3-1. But the drama was not to end as Halifax were awarded a penalty, and it was the much berated number five to take it. What was a really fiercely struck penalty smacked the cross bar and the rebound safely caught by Jamie Butler, much to everyone's delight. 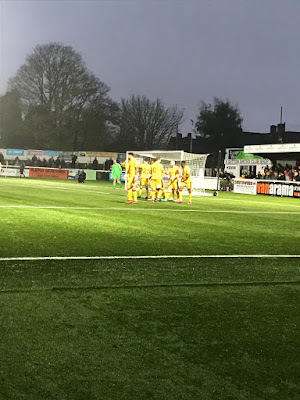 The drama extended into the final five minutes as Halifax got a second goal – a real mix up in defence allowed them to convert a long throw much like Stoke City as said above. As the 90th minute approaches eyes turn to the fourth official who produces the board for five additional minutes – how? What? Why? 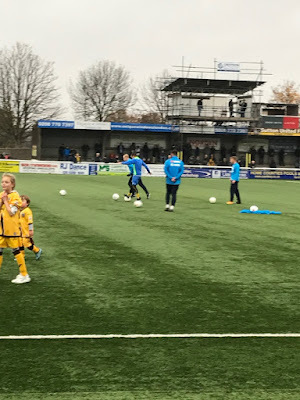 Thankfully the U’s see out these five minutes without too much fuss and it’s another three points, not just towards safety but who knows for a promotion push It seems the teams around us have dropped points with Dover drawing at managerless Leyton Orient. 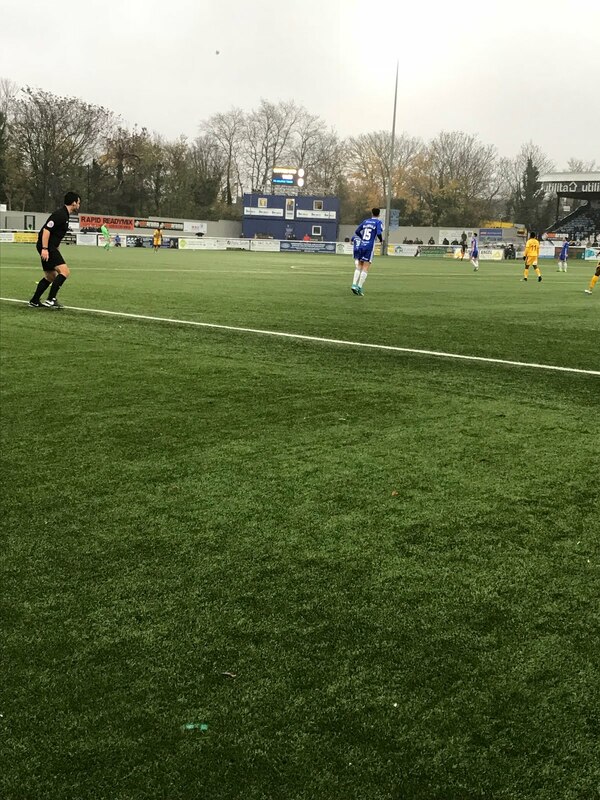 By the way, for the statisticians, the following substitutions were made Bailey for Taylor on 73, Tommy Wright for Dundo on 75 and Alfie Egan on for Tombo on 78. Plus yellow cards for Becks and Tommy Wright. Halifax received six yellow cards you'll be no doubt surprised to hear. Well done to a crowd of 1968 for staying out in what was not the finest of weather conditions and thoughts now turn to Tuesday night at home to Torquay United (sitting bottom of the league). Upon the return to the bar for drinks after and as I am standing with Leanne, in Rossi walks and I welcome him back with open arms. Shame you missed it Natalie! I should have asked Leanne to have taken a picture for me for blog purposes so you could all have seen this heart warming moment. Oh well! With the strikers now frequently scoring the Strikers are Key pot is building nicely and it’s the turn of the management to try and win the contents. JC steps up on their behalf to open the safe but he has picked the wrong key and the prize rolls over to next time. The jukebox is now getting a lot of attention as the likes of McFly, S Club and Backstreet Boys are selected, and let us not forget good old Chesney Hawkes. The latter of course selected by me! Oh come on, there is nothing wrong with a bit of Chesney! (Plenty wrong though - Ed). It is at this time I get a message from my sister who has had a picture with my niece and Jenny the Giraffe at the Christmas lights switch on in Sutton High Street. The face my niece is pulling is one of displeasure. Oh dear, plenty of time yet Emily for you to get to like our Jenny! As talk begins of food, we decide to head for a celebratory curry where Duke pulls out the classic line of “Hello John” to the waiters. Just see the episode of Only Fools and Horses where the Chinese kitchen gets painted in luminous yellow for the reference if you are unfamiliar. 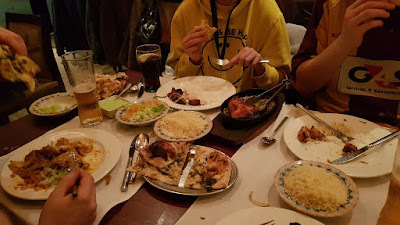 Think we ordered too many garlic naan breads though! As we leave, some head homewards, with the remaining few heading to O’Neills for a few more drinks. Although as soon as I step in the premises I get the worst case of hiccups ever and decide it’s probably time to call an Uber and head home. So that's all from me, I'll now leave you in the capable hands of Totts for the Torquay game this week. 3 points? That calls for a Curry!